I had run out of excuses. After five long, cold winters of professing interest and intention, I could no longer procrastinate. A thoughtful Christmas gift overcame my last line of defense ("Oh, but I'll have to go rent the equipment.") Last weekend, I finally followed a Canadian Native into the wintery woods. We were not looking for furs or prey, of course. Especially given that we were in a national park not far from Canada's quaint capital, which would host us for the night following our snowy adventure. I had skied in Eastern Canada before, and remain distinctively unimpressed by the tiny hills, low temperatures and pricey resorts. There is, however, another winter activity for which the local setting, with abundant snow, plenty of unspoilt nature and rolling hills lends itself. I'd always said that I'd be keen to give it a try. And so last weekend, I fastened my brand-new snowshoes. This magnificent kit is the next best thing a pedestrian can get to a 4x4 - in conjunction with poles, it allows the so inclined to master almost any incline, as it were. 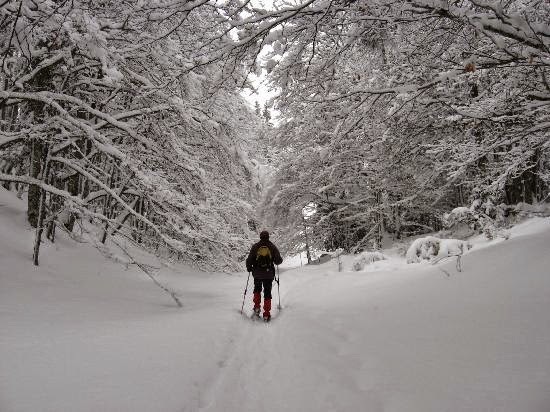 Unlike cross-country skis, which call for neatly traced trails, snowshoes are most at home in the pristine, powdery snow. They provide the thrill and satisfaction of going where no man has gone before - since the last snowfall, at least. Consequently, the snowshoe trails in the park were mostly a sequence of blue markers in the virgin forest, taking us deeper and deeper into nature and on a peaceful four hour loop around a frozen lake. Apart from the few occasions where our path intersected the cross-country paths ,we came across no one. Depending on the pace, tramping through the snow can be pretty vigorous exercise, and it kept us nicely warm. This would quickly change once one stops for a lunch break, though. Fortunately, my native guide had foreseen this issue and planned for our rest to be in a cozy hut, where helpful park rangers had already lit a wood stove. Soon enough, I was treated to a steaming beef stew to regain my forces for the trek out. Such winter hiking can definitely be recommended, and I am eager to repeat it. Much like its warm-weather counterpart, it has a meditative effect on the mind, by steadily exhausting the body. Yes, it requires a little more gear and planning. But it also comes with a most soothing advantage: In the snow, there are no bugs!